Hopeless Voters A Hurdle For Haiti's Presidential Hopefuls Battered, beleaguered Haiti holds presidential elections Sunday, nearly a year after its capital was devastated by an earthquake and amid a fast-spreading cholera epidemic. But many Haitians have little interest in this key election and little hope that any of the candidates can improve their lives. Haitians go to the polls Sunday in what some people are calling its most important election ever. The new president will have to deal with the cholera outbreak, more than a million earthquake survivors who are still living in camps, and rebuilding what was already the poorest country in the hemisphere. But first, there's another hurdle: Many Haitians say they're just not interested in the election. The Haitian presidency even in the best of times has been a dangerous, thankless job. Ever since independence in 1804, Haiti's leaders have been assassinated, have mysteriously died in office or have been deposed by enemies foreign and domestic. The current president, Rene Preval, during his first administration became only the second man in Haiti's history to complete a full, elected term. Despite the hazards, 19 candidates this year are vying for the job. And so far, none has emerged as the clear favorite. The most colorful is Michel Martelly, a popular, flamboyant musician known as "Sweet Micky." The novice politician has gained a following particularly among young Haitians. "I want to see hope in the Haitian kids," Martelly says. "I don't want to see kids as young as 5 years old carrying buckets of water in the streets begging for money, taking their clothes off to wipe people's cars in order to have food. I want to change things." Martelly is up against several veteran Haitian politicians, a powerful member of the business class and an evangelical preacher. One of the leading candidates is Jude Celestin, the head of the national construction company. 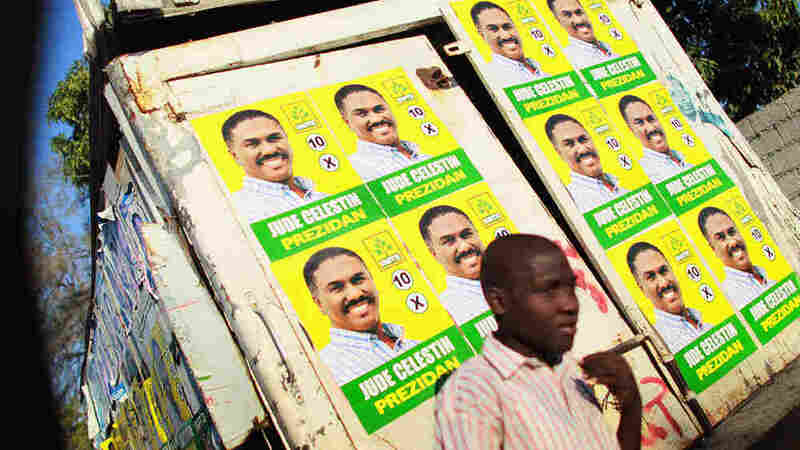 Celestin is running under Preval's INITE or “unity” party. He gained visibility immediately after the earthquake, as his construction crews were involved in rescues and clearing the streets. 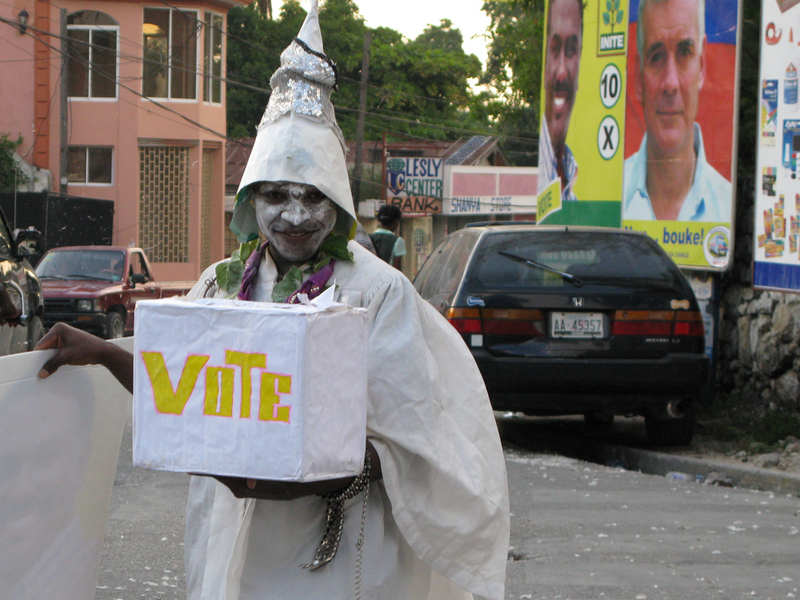 A festive supporter of Jude Celestin roams a street in Port-au-Prince encouraging voters to go the polls. And then there's former first lady Mirlande Manigat, who says she would be a completely new type of Haitian president. "I would say first of all I am a woman," she says, "and that is a very, very powerful factor that goes beyond my personality." If she wins, Manigat would be the first woman elected to lead Haiti. Manigat says that as a grandmother and the dean of a prestigious private university, Haitians trust her. Many ordinary Haitians, however, say they have little interest in this election and little hope that a new president can improve their lives. Former Defense Minister Patrick Elie says he has written off the upcoming polls entirely. Sitting in a simple outdoor bar under a canopy of almond and mango trees, he says the current candidates lack ideas, programs, leadership and courage. "We can't be pussyfooting around some of the serious problems that we are facing," he says. The capital is destroyed, and cholera is spreading more rapidly every day. He points out that disputes over land ownership have stifled efforts to move the more than a million earthquake survivors out of the tent encampments. "Nobody has a solid claim to the land, and the state doesn't have the balls to simply requisition the land," Elie says. "We're going to have to make these choices, hard as they are." Elie says Haitians right now need a Nelson Mandela or a Martin Luther King Jr., but he says that's not what they're being offered.